Tue., Dec. 26, 2017, 11:41 a.m. The number of breweries nationwide soared past 6,000, and Spokane and Kootenai counties chipped in with a handful of newcomers – though none followed the traditional stand-alone taproom model. TT’s Old Iron became the third brewer sharing space in Spokane’s downtown brewery incubator and adjoining Steel Barrel bar. Genus launched as the in-house small-batch brewery at the Nu Home Brew supply shop in Spokane Valley. Another pair of smaller Spokane breweries, Four-Eyed Guys and Bottle Bay, are available only at select bars and restaurants. And in North Idaho, Hayden-based Bombastic introduced its creative lineup through limited distribution and bottle releases while just launching a membership-based barrel-aged series (see bombasticbrewing.com for details). New breweries haven’t abandoned taprooms. After building its brand through distribution, Whistle Punk opened its downtown Spokane location in May, and more are on the way for 2018. Millwood Brewing aims to open sometime next month in the former Cunningham photo studio just west of Argonne on Frederick, while Mountain Lakes looks to launch by March downtown at Riverside and Browne. Grain Shed also expects a March opening as part of a bakery/brewery complex in the South Perry District using locally grown grains. Snow Eater is shooting to open by summer in Liberty Lake. In North Idaho, Rathdrum’s Westwood Brewing plans to add a brewery to its current restaurant operation next spring. And two new breweries, Matchwood and Utara, are taking shape in Sandpoint. While the number of breweries keeps climbing, the growth in craft beer sales is slowing down – leading to predictions of a shakeout as competition increases and the market tightens. Since mid-October, three area breweries have closed for various reasons: Slate Creek in Coeur d’Alene, Downdraft in Post Falls and New Boundary in Cheney. River City announced it will close its downtown taproom at year’s end to focus on distributing its beer and beginning to bottle. But while taproom traffic was down, the brewery says, overall sales are stronger than ever. India pale ales remain king across the country but sour beers keep growing in popularity, a trend that continues to take hold here. Most local breweries have produced quicker kettle sours – typically fruit-flavored – while a few, including Iron Goat and Young Buck, have launched longer-term barrel-aged sour programs. And IPAs have their own new twist with cloudy, juicy New England-inspired versions. The “haze craze” also has caught on locally, including an innovative yearlong series by Perry Street. For the second straight year, a local brewery brought home a gold medal from the Great American Beer Festival, the nation’s biggest beer event. Orlison earned top honors for its Boulder Garden Brown, following in the footsteps of Perry Street, which won gold for its Session IPL in 2016. Only two other area breweries have accomplished the feat since the competition began 30 years ago: No-Li in 2012 and the former Coeur d’Alene Brewing back in 1988. Inland Northwest breweries bagged nine medals at the Washington Beer Awards, including two golds for River City and one each for Orlison (for Boulder Garden), Bellwether and Kettle Falls’ Northern Ales. And Manito Tap House was named Washington’s best beer bar in an online poll conducted by the Brewers Association. 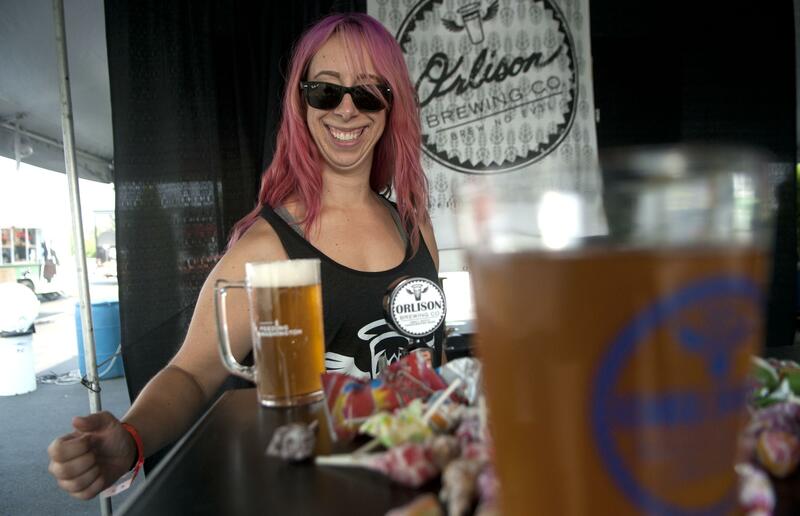 The Inland Northwest Craft Beer Festival had another record attendance in its fourth year at Avista Stadium (and eighth overall), while the Spokane Brewers Festival featured an expanded lineup of 40 breweries and cideries for its second year at the Spokane Arena. No-Li’s FrostFest small-batch festival moved to the Arena for year two and drew more than 2,000 people with its winter carnival atmosphere. A pair of Spokane craft beer bars got brighter new looks under new owners, with The Viking reopening after extensive renovations and the former Jones Radiator reborn as Community Pint. In North Idaho, Coeur d’Alene Brewing founder T.W. Fisher got back in the game with his Midtown Pub. On a final, sad note, the local beer community lost a quiet but significant player with the passing of Iron Goat co-founder Paul Edminster from complications of cancer at age 51. No-Li’s Born & Hazed IPA (7.1 percent alcohol by volume, 85 International Bitterness Units) is an unfiltered version of the regular Born & Raised. Orlison released an imperial Cascadian dark ale dubbed Black Site (9.1, 75). Iron Goat’s former Cherry Chocolate Stout has returned as Chernobyl Chocolate Meltdown (8.1, 31). Perry Street is pouring a tart Blackberry Gose wheat beer (5.2, 6). Bellwether’s Four Branches IPA Braggot (7.6, 20) is brewed with orange blossom honey and hopped with Chinook and Columbus for a fruity, piney character. Community Pint is tapping the CBS (Canadian Breakfast Stout) from Michigan’s Founders (11.7), an imperial chocolate/coffee stout aged in maple syrup bourbon barrels, for its New Year’s Day potluck party from 10 a.m. to 2 p.m. Published: Dec. 26, 2017, 11:41 a.m.